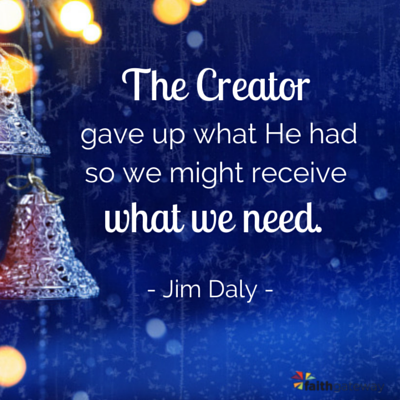 It’s been called the “Paradox of Christmas,” the fact that the Creator of heaven and earth gave up what He had so that we might receive what we need. It’s in this ultimate selfless act that we find the origin of exchanging gifts between loved ones and friends. We try to find that perfect gift to communicate our affection for each other. In many circles the tradition has been trivialized and commercialized, but this is why we give – to be reminded that God so generously gave us the gift of His Son on that first Christmas. But here is another paradox of the season for me: When I was child, beyond the necessities of life, my needs were minimal. Yet, I was rarely satisfied. I always wanted one more G.I. Joe. One more toy under the tree. I was convinced that I was always just a few dollars shy of all my dreams coming true. Now, nearly a half-century later, and blessed with a wonderful wife and two growing sons, I see life very differently. As the breadwinner of our family and tasked with juggling all types of responsibilities both personally and professionally, there are times when I am nearly overwhelmed by it all. Yet, unlike when I was a child, it really doesn’t take much to satisfy me anymore. I feel like my needs are minimal. I find joy in the simplest of things and realize that in any case, all the money in the world wouldn’t buy what I really want for Christmas. Read: Does Christmas Makes Sense To You? I want every child to grow up in a home with a mom and a dad, with parents who tuck them into warm beds on cold nights with a kiss, a hug and prayers of assurance. I want the most innocent and vulnerable among us, pre-born children, to be protected under the rule of law. I want God’s gift of marriage to be celebrated, not redefined. I want our nation’s schoolchildren to walk in and out of their classrooms with a spirited and excited spring in their step, not looking over their shoulder or wondering if their school is safe. I want a world where we celebrate not denigrate our pastors, these brave and courageous individuals who extend God’s love to all people and who preach the Gospel with boldness and courage. I want to live in a colorblind society, among people who see the character of a person, not the pigment of their skin or their place on the social class ladder. I want our leaders to respect our religious freedoms and not force us to choose between violating our conscience and following the laws of the land. I want peace, not war – militarily, politically, physically, socially and emotionally. God descends to re-ascend. He comes down; down from the heights of absolute being into time and space, down into humanity… down to the very roots and sea-bed of the Nature He has created. But He goes down to come up again and bring the ruined world up with Him. One has the picture of a strong man stooping lower and lower to get himself underneath some great complicated burden. He must stoop in order to lift, he must almost disappear under the load before he incredibly straightens his back and marches off with the whole mass swaying on his shoulders. As we pause to celebrate the birth of Jesus, let us lift up our eyes and ponder anew the miracle of Christmas. Kindly share your thought with us below. God bless you real good.